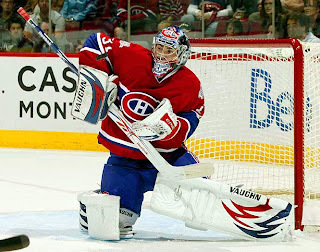 During the 2010-2011 season Montreal Canadiens' goalie, Carey Price, turned out his best campaign since coming into the league four seasons ago. Price set career highs in game played, wins, shutouts, goals against average, and save percentage, with 72, 38, 8, 2.35, and .923 respectively. Price's 72 games played was the second highest in the league behind only Cam Ward of the Carolina Hurricanes . While his 38 got him a share of first place in the wins department along with Vancouver Canucks' goalie Roberto Luongo. However along with playing so many games comes the opportunity lose those games. Price did end the season tied for most wins, but on the other hand he was also tied with Florida Panthers' goaltender Tomas Vokoun for the second most loses last season. You win some, you lose some right? Needless to say Price still played some of the best hockey of his career last season. Along with his stellar play came an amazing save on Chad LaRosse of the Carolina Hurricanes (see below). After failing to clear the puck out of their own zone, the Canadiens found themselves scrambling back into defensive coverage. While the Canadiens hurried back Hurricanes' forward, Chad LaRosse snuck back door and set himself up for what seemed to be a for sure goal. However Price jumped off the post as the puck found LaRosse on the back door and snagged the puck out of the air before it hit the back of the net.